Freedom Forum Institute > News & Commentary > Inside the First Amendment > Genocide in Syria: Who lives, who dies, who cares? Given the magnitude and urgency of the humanitarian crisis, the U.S. share should be more like 100,000 in 2016. This is, after all, genocide – the gravest crime against humanity under international law. ISIS is systematically eradicating Yazidis, Christians, Shia Muslims and other ethnic and religious minorities in territories controlled by the terrorist group in Syria and Iraq. To compound the horror, the Syrian government targets and kills its own citizens based on their ethnic, religious or political background. 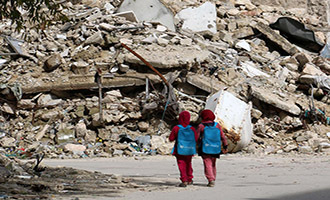 According to international observers and reporters, the Bashar Assad regime conducts mass killings, murders civilians using barrel bombs and chemical weapons, destroys hospitals and blocks humanitarian aid. Stopping genocide should top the list of America’s priorities – whatever the cost and sacrifice. Beyond significant national security concerns and strategic interests, the U.S. has a moral obligation to give asylum to the victims, provide humanitarian aid, and do whatever possible diplomatically and militarily to halt the killing. So where is the moral outrage? Where is the robust public policy debate on how best to act in the face of genocide? In a campaign season dominated by personal attacks and celebrity trivia, many media outlets – especially cable news – largely ignore the fate of vanishing religious and ethnic communities in Syria and Iraq, choosing instead to feed Americans with a steady stream of “breaking news” about the latest Trump insult or Clinton email dump. Occasionally, a powerful image or story from Syria will break through the noise and touch the heartstrings of the American public. Many tears were shed when the photo of a five-year Syrian boy named Omran Daqneesh went viral. Sitting dazed and bloodied in an ambulance in Aleppo, Omran briefly became the face of the human tragedy unfolding in Syria. First, give until it hurts. The single most important and immediate action we can take is to send money to one of the heroic organizations on the front lines of saving lives and giving refuge to the refugees. Top-rated charities providing humanitarian relief to Syrians include American Refugee Committee, Doctors Without Borders USA and the International Rescue Committee. Second, speak up for admitting more Syrian refugees and volunteer to help families resettling in the U.S. Support aid to our friends and allies around the world who are struggling to resettle millions of people with limited resources. Third, help put ending the genocide at the top of the national agenda. This would mean, among other things, requiring candidates for high office offer comprehensive diplomatic and military plans for addressing the crisis in Syria and Iraq. What future generations will long remember about this moment in history is not bombastic rhetoric about border walls or deleted emails. Future generations will remember us – and judge us – by what we did or did not do to stop the genocide, the ultimate denial of religious freedom. Thank you! You have expressed the feelings of so many of us who are frustrated by the cheap rhetoric of the current political season, as genocide and the plight of refugees are brushed aside. I will take the actions that you suggest, and encourage to do the same.